15:30 – 16:30 Family Taiko Fun – (6+) £5pp, £4pp for groups of 3 or 4 people. All workshops take place at St. Paul’s Parish, De la Beche Road, SA2 9AR. 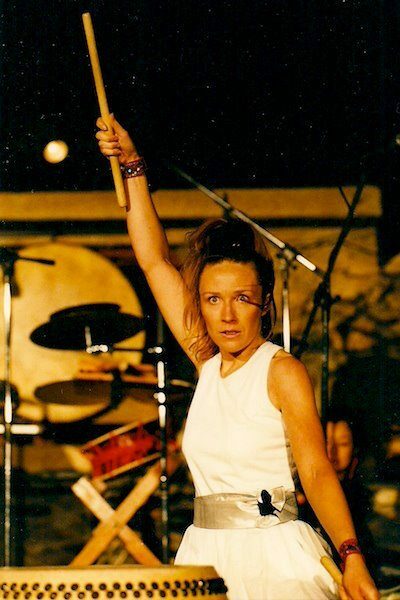 Liz first began playing taiko in 1996 with Mugenkyo (the UK’s first professional Taiko Group), learning also from their taiko teacher Masaaki Kurumaya in Japan (whom she continues to work alongside today). Liz has toured and taught internationally in France, Germany, Greece, Spain, Italy, Austria, Albania, Ireland, Hungary, Malaysia, the United States and Japan with world established artists such as Joji Hirota, Pete Lockett and Guo Yue. 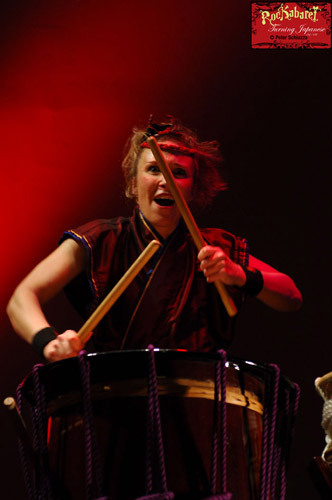 In 2002, Liz set up the ‘Tamashii School of Taiko- Do’ for people interested in learning not only about Taiko rhythms but also wanting to experience further insight into the deeper traditions, disciplines and etiquette of Japanese Taiko . She runs regular classes and Single / Multi Day Taiko workshops through Tamashii School of Taiko. Her own performance troupe ‘Tamashii Daiko’ have travelled extensively around the UK providing performances which from local community events and festivals to high profile events such as the Purcell Room and Westminster Abbey in London. 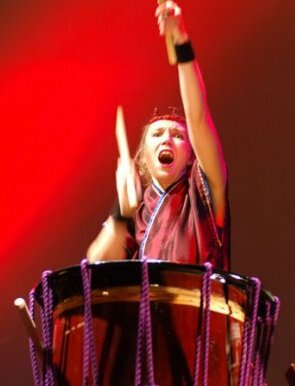 She has run several summer schools for Taiko at venues including Kingston University and the prestigious Royal Academy of Music. As well as teaching throughout the UK, she has taught and helped create Italy’s first professional Taiko Group Kyoshindo and is now helping create the first Taiko Group in Greece, Athena Daiko. Since 2002 Liz has travelled every spring to Japan to co facilitate a Taiko Course for International Students in Fukui, Japan with her teacher Masaaki Kurumaya at the purpose built ‘Kurumaya Dojo’. She has performed in Japan many times and has appeared alongside her teacher in several national TV documentaries.